Besides selecting reactions, Reactor users should also provide their reactant molecule(s). Reactants can come from molecular files, but direct input is also available by drawing molecules. 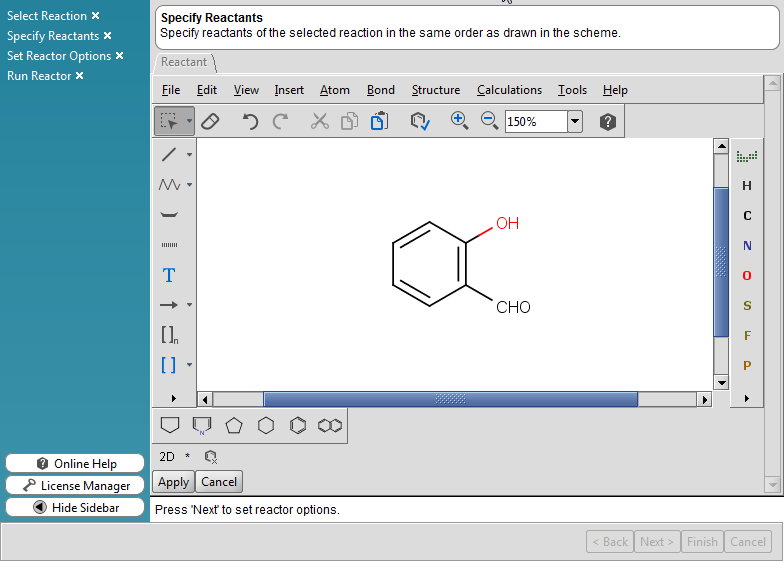 For drawing molecules, a MarvinSketch Editor is provided. The order of the reactants (reactant files) corresponds to the reactant order of the relevant reaction. Reactants are processed according to either sequential or combinatorial mode. If the number of reactant molecules matches the number of reactant molecules in the reaction equation then a single reaction is processed with the specified reactants. However, if the number of reactants exceeds the number of reactants required by the reaction equation then one input file is taken in place of each reactant. After providing your reaction and the corresponding reactants, you have to specify a few settings of Reactor to be used in the virtual enumeration.